SOPHIA ANDRIKOPOULOS IS a fifth-generation Wyoming gal with Cuban roots who’s just as comfortable wrangling cattle at her father’s family ranch in Daniel as she is baking in her grandmother’s Miami kitchen or designing a wire mesh bench. (Her bench design, which she fabricated in the Jackson Hole High School Digital Fabrication Lab, or FabLab, won a contest held by the local nonprofit Vertical Harvest.) Two years ago, her parents had a custom, prefabricated home delivered to East Jackson; a crew assembled it in six hours. Sophia videotaped it. Now she’s all moved into her bedroom, where her sophisticated, urban style is evident in clean lines and a muted color palette. But the Pearl Jam poster taped to the wall, the clothesline of Polaroid pictures, and the article about the high school drama club getting busted for possession of marijuana over her desk give away her age: sixteen. A self-described nerd, Sophia loves speech and debate and playing clarinet. 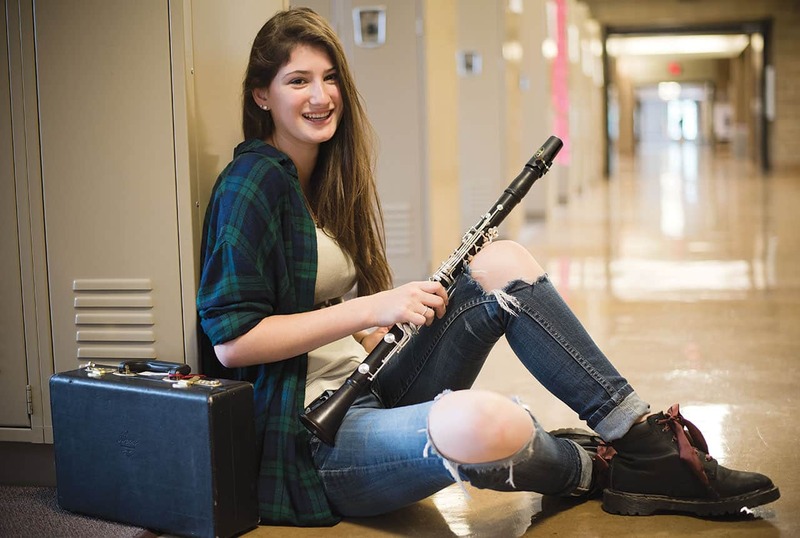 Last year, her musical talent landed her a spot at the All-State Band competition in Hawaii. This year, she barely has time to practice. Q: What’s your earliest musical memory? A: The first song I remember hearing was “Free Fallin’ ” by Tom Petty. I was three years old. A: I chose it in sixth grade. I wanted to play sax because it’s a supercool instrument, but everyone wanted to play sax. So I bit the bullet, and I learned I was pretty OK at learning it. I really, really liked playing. But I’ve never been a fan of classical music. A: I like anything but country and really lewd rap. I like rock. Q: Where do you play besides the usual high school band? 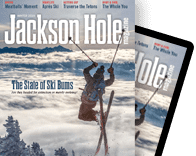 A: I play sometimes with the [Jackson Hole] Community Band. It’s superfun to play with a talented group of mostly adults. We tried to have a marching band in high school, but it didn’t happen. We did parades around Wyoming all summer. Q: Met any famous musicians? A: Michael Franti at [Grand] Targhee and Sara Bareilles. That was really cool. And I met Gregory Raden [first clarinet in the Dallas Symphony Orchestra] at the Grand Teton Music Festival, where I was in the mentorship program. I got to eat lunch with him and see him play Mozart. He’s such a nice guy. Q: Are you a band nerd? A: I’m not a nerd because I’m in band. I’m just a nerd because I am one. Q: What about life outside of music? A: It’s my third year doing speech and debate. I’m the captain this year. There are new debate topics chosen every month. I like original oratory, drama, and humor. I love making people laugh even if I’m the most strange, most sadistic, dark-humored person I know. Q: Binges of dark stuff on Netflix? A: I’m watching Twin Peaks with my mom, and she’s cheating on me. But it’s OK; I’m cheating on her, too. Q: Plans past high school? A: I’m thinking about what I’d like to do in college: be a product designer. Growing up in Jackson I’ve really appreciated beauty, but I’m a math person. I’ve always been drawn to functionalism, too. Design is a happy medium. I need things to be functional and pretty. I really, really like the clash between nature and a cold, modern aesthetic. Q: And you like baking? A: I make these cookies, alfajores. They are shortbready, citrusy cookies with dulce de leche sandwiched between. My mom makes a lot of Cuban food. I get Cuban culture definitely through food and whenever I speak Spanish.